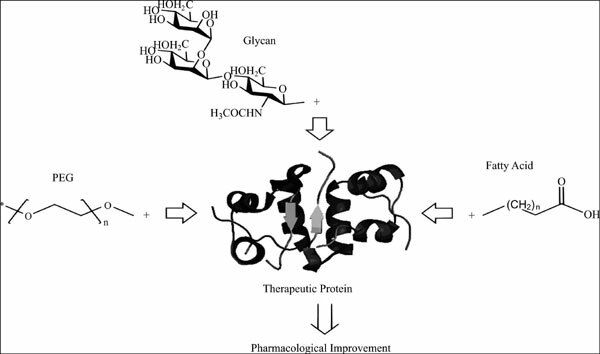 Therapeutic proteins can be pharmacologically improved by conjugative post-translational modifications through the rational design of their structure and production process. N- and O- linked glycosylation can confer advantages to proteins and can be controlled by the process conditions, producing cell lines and enzymatic expression or activity. The resulting glycan profile influences their pharmacological features such as in the biopharmaceutical velaglucerase alfa. Conjugation of polyethylene glycol onto therapeutic proteins has been used to overcome pharmacological limitations. They can be site-specifically or randomly linked through the reaction between a terminal group of the polyethylene glycol molecule and an amino acid residue group of the protein. Both components (protein and polyethylene glycol) participate in pharmacological mechanisms, enabling a longer half-life for peginterferon beta-1a, for example. Fatty acylation of proteins occurs in cells via some known reactions that may involve different linkages, fatty acids, modified residues, and enzymes. Insulin degludec is a fatty acylated biopharmaceutical formulated to solve the problem of variability in insulin exposure associated with other products. Conjugative post-translational modifications can be used to pharmacologically improve even therapeutic proteins produced by prokaryotic cell lines while exploring them may result in the development of other potential uses as well as new generations of biopharmaceuticals. Keywords: Biopharmaceuticals, fatty acylation, glycosylation, PEGylation, pharmacology, PTMs. Keywords:Biopharmaceuticals, fatty acylation, glycosylation, PEGylation, pharmacology, PTMs. Abstract:Therapeutic proteins can be pharmacologically improved by conjugative post-translational modifications through the rational design of their structure and production process. N- and O- linked glycosylation can confer advantages to proteins and can be controlled by the process conditions, producing cell lines and enzymatic expression or activity. The resulting glycan profile influences their pharmacological features such as in the biopharmaceutical velaglucerase alfa. Conjugation of polyethylene glycol onto therapeutic proteins has been used to overcome pharmacological limitations. They can be site-specifically or randomly linked through the reaction between a terminal group of the polyethylene glycol molecule and an amino acid residue group of the protein. Both components (protein and polyethylene glycol) participate in pharmacological mechanisms, enabling a longer half-life for peginterferon beta-1a, for example. Fatty acylation of proteins occurs in cells via some known reactions that may involve different linkages, fatty acids, modified residues, and enzymes. Insulin degludec is a fatty acylated biopharmaceutical formulated to solve the problem of variability in insulin exposure associated with other products. Conjugative post-translational modifications can be used to pharmacologically improve even therapeutic proteins produced by prokaryotic cell lines while exploring them may result in the development of other potential uses as well as new generations of biopharmaceuticals.